In Syria, the Middle East, a conflict that began in March 2011 has not ended even after seven years. The conflict has caused serious damages to both the Syrian people and their precious cultural heritage. Since 2017, the Japanese government and the United Nations Development Programme (UNDP) have been supporting Syria in preserving its cultural heritage. In addition to the Archaeological Institute of Kashihara, Nara Prefecture, academic institutions, such as the University of Tsukuba, Teikyo University, Waseda University, Chubu University, and the Ancient Orient Museum, plan to accept Syrian experts for a variety of training seminars in archaeology, and conservation and restoration of cultural properties, since February 2018. 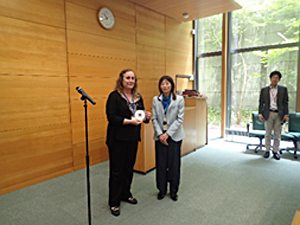 Tokyo National Research Institute for Cultural Properties (TNRICP) invited two Syrian specialists to Japan from May 15th to 30th, 2018, (two weeks) to conduct training seminars on conservation and restoration of paper cultural properties. 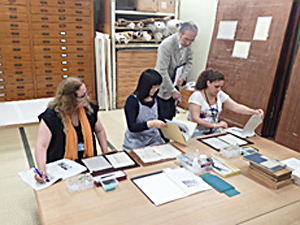 At the seminars organized in cooperation with the National Diet Library and the National Archives of Japan, they learned basic restoration and conservation methods for documents and books. In January 2018, a news report that the ruins of the Ain Dara Temple, built in Northwestern Syria during the Syro-Hittite period, were severely damaged by an air raid was released. For this temple, TNRICP conducted a conservation and restoration project from 1994 through 1996. Project leader and Researcher Emeritus Tadateru NISHIURA provided related materials of that time. The materials were offered to the Directorate General of Antiquities and Museums in Syria through the Syrian specialists invited to the seminars for utilization in the smooth restoration of the remains. In addition, valuable old photographic data on Aleppo, Damascus, and Palmyra, shot by Shin WADA in 1929 and 1930, which are now in possession of TNRICP were provided.